I cut my teeth on Gamma World in the late 70’s, being blown up by Torc Grenades and eaten by psychic vegetation. But post-apocalyptic wasn’t really my thing. It would be another 30+ years before I played it again. My friend Dave ran a homebrew Fallout rpg, based on a video game I never dug. Had a great time, but filled my wasteland quota. But in 2014 I started my History of Post-Apocalyptic RPGs, one of the most requested genres. 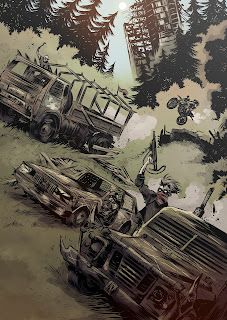 That finally put Mutant: Year Zero on my radar. It wasn’t because the game immediately appealed to me. Instead I was trying to trace the evolution of the Mutant RPG, a Swedish release from 1984. Mutant had gone through multiple iterations- becoming cyberpunk in one and spinning off Mutant Chronicles in another. A couple of smart folks in my G+ feed recommended Mutant Year Zero. So I picked it up. And I read it. And then I ordered the GM screen. And then the dice sets. And then the expansions. In Mutant Year Zero you play- as you might imagine- mutants in a post-apocalyptic wasteland. How that came to be isn’t clear. But it’s dark. You live in a desperate community overseen by an Elder, called an Ark. The world outside’s full of horror and The Rot. Your community’s primitive, just hanging on the brink. In the early days of a MYZ campaign, you check at the end of session to see how many people died. Even the mutations are messy and dangerous. They can explode and more problems. These challenges t ought to feel dark and hopeless. Partly that comes from how you build characters, partly from each session’s opening activity. I have a group of players who came out of a Fate-inspired campaign (control, competency). I worried how they’d react to this switch, but they’ve embraced it. Sherri’s said that Mutant Year Zero stands at that perfect point between Trad and Indie gaming for her. It merges the atmosphere of both. You’ll first see that in character creation. You choose one of eight roles (Gearhead, Slave, Enforcer, etc). These are presented “playbook style.” So In addition to mechanical decisions you make picks from sets of choices: about your appearance, your relationships to other PCs, your relationships to NPCs, your Big Dream. These build bonds and develop details about the world itself. The mechanical side of the game’s pretty simple. You assign numbers to the four stats and the twelve skills. These are low numbers, five’s max . Each role gets a unique 13th skill. These include the pathfinding of the Stalker, the deal making of the Fixer, the beast mastery of the Dog Handler, and the gang control of the Boss. You get one talent, feat-like abilities, and one random mutation. You also write down your gear. Then you build your Ark. 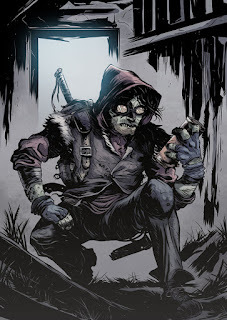 Sidebar: Gear: Here’s where Mutant Year Zero gets me. Encumbrance’s a traditional mechanic, a means of invoking ‘realism’ in the setting. In MYZ it becomes another point of pressure and hard choice. Normally I ignore encumbrance and item tracking because the complexity to payoff ratio’s pretty high. But this system’s so simple it works. You have a number of slots-- represented by rows on your character sheet-- equal to twice your Strength. So anywhere from 2 to 10. Most items take up one row. Heavy items take two rows and you can write in two light items on one row. OK, enough space for equipment and good. But you also need supplies to survive- grub, water, and booze. Four rations of these count as a single regular item. What do you do when you find a cool object in the waste? What do you drop? After character creation you take the hopeful connections to other characters and use those to build your Ark. As you read out your links and name NPCs, you collaboratively map out the community. You make a series of choices about what it looks like, how it feels, who has power. This starts you out with a collective sense of command and authority. You build a cool place you can invest in. Then you find out what dire straits it is in. You have four development tracks- all important and vital: Food Supply, Technology, Society & Culture, and Warfare & Defense. Each has an impact on the fiction and the mechanics. For example, you need high Tech to understand artifacts easily. You need Food to reduce the number of deaths each session. All of these tracks start at zero. But you can change this. There’s an “Assembly” at the start of each session where you choose a “Project”. These start simply: Basic Palisades, Pigsty, Temple. Later as they meet certain requirements, they get more interesting: Tavern, Water Wheel, Ink & Paper. It’s a Civ-like tech tree. Once a project’s selected, you can spend some your time and energy time working on it. You roll an associated Skill and count successes towards the number required to finish it. Early projects usually take a session to complete, later ones may take more. Of course you can only do one project per session. So every choice matters. For example, working on a project can be a hard call- other obligations and the siren call of exploring the Zone can eat up time. In my group, the projects moved to the center. Players love them. They dig the choices and how they reshape the terrain of the community. It also ties into another important setting element: artifacts. I love the goofiness of the artifacts in this game. When an air mattress can be a significant find, celebrated by the players, you know it works. MYZ has a card deck which includes Mutations, Artifacts, and Threats. They’re a great and tangible handouts and players love them. It makes randomization easy. How do these connect to Ark development? You’re supposed to turn over any artifacts to the Elder. They place them in “The Dawn Vault.” In game terms, artifacts turned in can raise your Ark’s ratings. A chainsaw gives +d6 Tech, a painting gives +d6 Culture, a crossbow gives +1 Tech and +1 Warfare. There’s social pressure to do this, which makes the choice interesting, especially when something’s useful. My players have leaned towards sacrificing things in order to make the Ark better. DO YOU WANT TO ROLL AGAIN? I need to dive into the Mutant Year Zero’s mechanics for a moment because they’re so supportive of the atmosphere. The game reserves test for important places; it specifically says to work to avoid perception-type rolls all the time. When you do make a test, you roll a pool of d6’s based on Stat + Skill. If you have appropriate gear you may roll its bonus dice. MYZ sells a set of dice for the game, you don’t have to use them, but they’re nice. Stat dice are called Base Dice (they’re yellow), skills use Skill Dice (they’re green), and equipment uses Gear Dice (they’re black). Many of the unique role skills give bonuses to spend extra successes on. For example the Gearhead can make things stronger, have more uses, or be more reliable. So again, all you need is one success…but more is better. And you always have the option to push your roll. If you do, you pick up all the dice that don’t show a “1” or “6”. You reroll those. Add in any successes from “6’s”. Woot! Look how great and easy that was. But…if you rolled any “1’s” on your Base dice (those from stats) you take damage on that stat. See your stats are also your damage tracks. So you get worse as you take damage. And keep in mind your stat’s going to be 5 at most. So that’s pretty rough. As well, if you rolled “1’s” on your Gear dice, you reduce that items rating by one per. This makes for a tough, push-your-luck choice. Let’s say you really need to make a roll. Desperately need to. But on your first attempt, you rolled two “1’s” on your Base dice. Now you know that if you push your roll, you’re definitely going to take 2 damage on that stat. And you’re rerolling one other Base die, so if it comes up a “1” as well, you’re going out. But you’re also rerolling a bunch of Skill and Gear dice, so odds are decent you’ll get a success. These other dice can’t do damage to you, but you might deplete your equipment. But you have to reroll them all; you can’t cherry pick. You can see the pressure. In play it’s awesome. We don’t roll that much, but when we do, it’s significant. Want another push your luck mechanic? Consider mutations. Each session, you get a Mutation Point (MP), used to activate powers. As well, when you take damage from pushing rolls, you gain an MP per damage. So there’s some reward built into the system. Now when you actually activate a mutant power it happens. There’s no resistance or skill check. You spend a point and do X. I like that. BUT you do roll a die for each MP you spent. If you roll a “1,” then there’s a chance of a misfire. You roll another d6 to see what happens. That can be good: overclocking your powers or refunding your MP spent. Woot! But it cancan be bad, in which case you gain a new mutation power. But you also permanently lose a stat point. 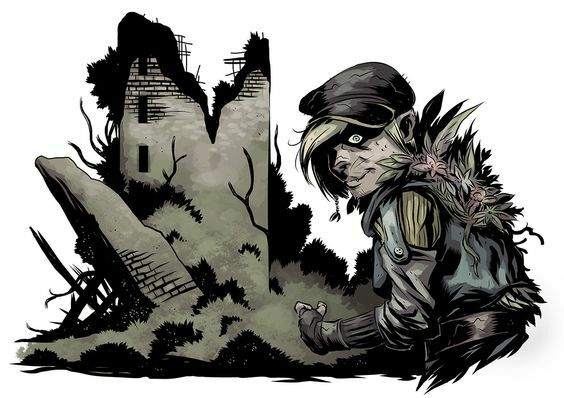 Sidebar: Incidentally, Paul Beakley's written a ton of smart stuff about Mutant Year Zero. If you're interested, I recommend checking out what he says. He sees a lot of details I miss. So what pushes you to the choices? What do you actually do in the game? Generally you’ll spend some time within the community, usually choosing between working on a project or carrying out your character’s agenda. You’ll also be responding to the Threat on the table, which may mean staying at home or venturing out into the zone. At the start of a session, the GM randomly determines the Threat. I’ve been using the card deck for this, setting aside those I’ve already drawn. The core book has a random table. After the Assembly, the GM sets the stage and presents that threat. Some are local—sabotage within the community; some are nearby—some kind of monster stalking those who venture just outside the ark’s borders; some require a journey—locating a new filter for the community’s water purifier. They’re all robust and easy to riff on. A few might require more work (a murder among the community for example). Regardless Mutant Year Zero suggests not prepping for these. You should run with the randomness. It offers some other ways to do this, but the message overall is: put it out there and see what happens. Players will find their fun. On the one hand you may really dig the Ark stuff. The game supports that with nice random tables for NPCs. There’s always going to be tension among Bosses within a camp, so you have cool power play stories. MYZ encourages social interactions in a couple of ways. First, several roles have skills that function mostly within the Ark. For example the Fixer can take time to set up deals in order to generate money (in the form of bullets) and/or resources. Second, there’s an easy mechanic for social manipulation, whether that’s via charm or intimidation. That doesn’t exclude role-playing scenes, but offers a nice backbone for it. Finally, the way MYZ doles out experience incentivizes social connections. It uses a series of questions (ala various PbtA games). Each “yes” answer generates a point of XP. Did you do work on a Project? Did you sacrifice or risk something for the NPC you want to protect? Did you sacrifice or risk something for the NPC you hate? Did you sacrifice or risk something for your PC “Buddy”? Did you make progress towards your Big Dream? But you’re as likely venture out into the Zone, the land outside your Ark. And that’s a trad Hexcrawl. Mutant Year Zero supplies several maps broken into squares: desert, grey-tinged, pseudo New York, etc Take your pick. My players chose one with many lakes.. At the start of the game, you mark on the map. X marks the Ark. It’s hugely satisfying to take a permanent marker and writing on something like this. You can see the shape of the terrain, spot weird details printed on the map, and write in discoveries as you make them. This is some of the trad that Sherri mentioned. MYZ has great tech supporting exploration. 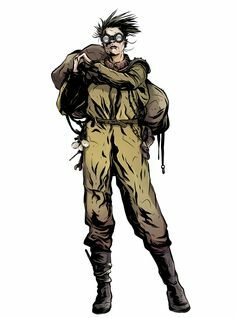 On the players side, they have to deal with questions of supplies and encumbrance. How armed are they? What artifacts are they carrying? How much grub and water do they take? That last one’s important because they have to spend one of each per day or suffer penalties. But they’re also the resource they spend to heal damage. Don’t take enough and they might be limping along for a long time. Eventually the PCs might buy talents to help offset this, but it remains a challenge. They also have to track the Rot, points of contamination which may build up in their system over time. On the positive side, several of the roles have cool skills related to exploration. The Stalker’s the most vital. Their skill Find the Path allows them to spot danger, move the group through quickly, or locate any cached artifacts. Players get XP for exploring zones as well. On the other side, the GM has a set of great and easy to use random tables. That allows them to generate the kind of zone, the terrain, special features, and threats very quickly. It strikes a balance between too simple and too detailed. They can generate these on the fly or put together a list to work from. It supports the improvisation. Plus Mutant Year Zero has write ups for several special zones with bigger stories. GMs can drop these in easily. 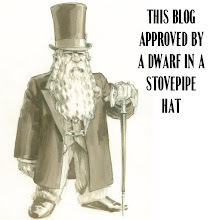 Many offer new factions and peoples the PCs will have to deal with. Free League has also released several Zone Compendiums with new areas. Beyond that there’s also a meta-plot story connected to the origins of the PC’s ark and the fall of the world. Gamemasters can choose to use that or not. Does it hold together? I’m not a usually a random charts GM. I’ll look through them for inspiration and sketch out lists for the game. They’re more toolbox than a tool. 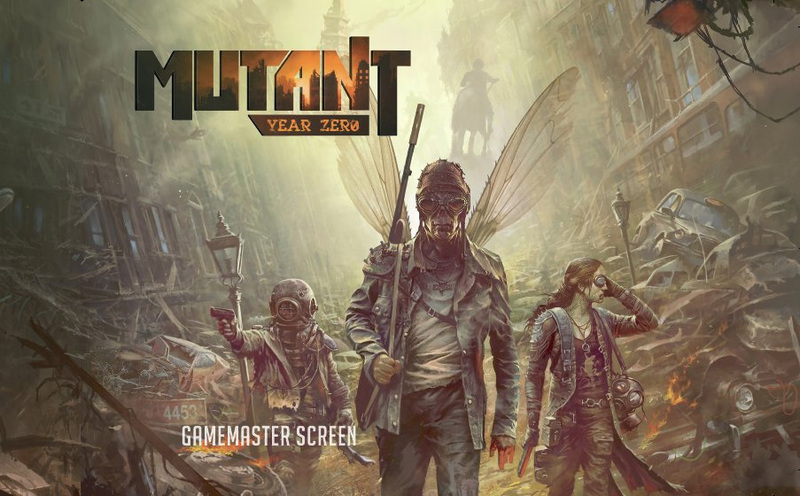 But Mutant Year Zero hits a sweet spot. It generates exactly enough bits to frame things. It plugs in the threats easily. It makes everything reinforce the atmosphere. I love it. Last session the players worked their way through multiple zones. They’d managed to salvage a broken down truck a couple of sessions before. Now they set out for a strange location they’d gotten coordinates for. But they planned to do that via an Industrial Dump run by an NPC they’d met. We went through ghostly woods, they set fire to horrible zone crows who tried to keep them out of a building, they explored an abandoned church with strange graves outside, they opted to go around an unmoving yellowish fog, they sic’d a giant boar they’d mind control onto a group of cannibals holed up at an old gun range, they got caught in a torrential rainstorm as they traveled along the edge of a massive crater. Finally at the dump site they got to dig through garbage, looking for artifacts and interesting scrap. That was a half-hour plus of rolling on the giant random item table: trombone, electric toothbrush, Santa mask, electronic keyboard, and more. They found only one artifact but it was awesome, a leather jacket in great shape with a flaming skull on the back. 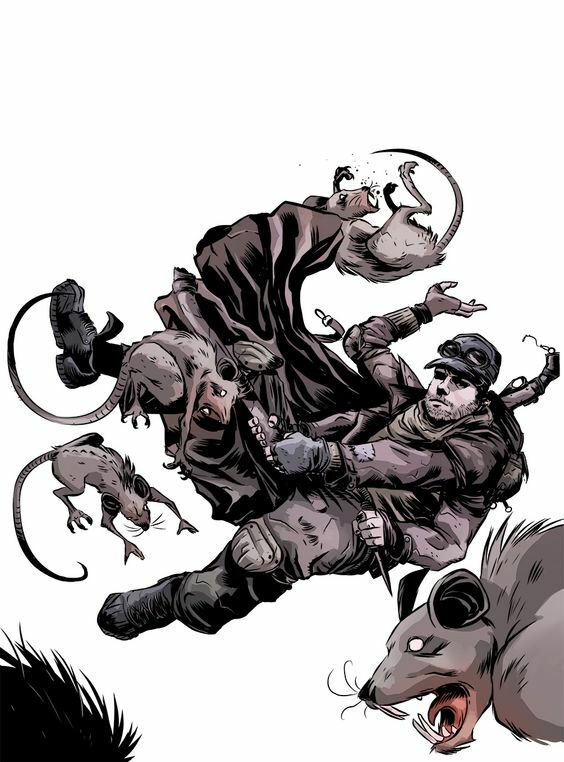 In short I’ve had a great time running Mutant Year Zero. I’ve not really run post-apocalyptic before, and MYZ makes it easy. It has the kind of lean mechanics I’m more comfortable with these day. It makes usually trad gameplay elements (like the Hexcrawl) work within that context. The system doesn’t take long to get, but it hides the sting. Life’s tough for your mutants. Your powers can kill you. Exploring can murder you. Just being outside can poison you. But for all that, seriously for all that, it feels hopeful. Players can build their Ark and leave a lasting legacy. I recommend it. 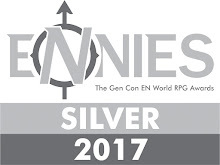 Sidebar: Other Worlds: Mutant Year Zero has a sequel game: GenLab Alpha. It’s in the same setting, but you play Anthropomorphic Animals trapped in an automated experiment. The system’s entirely compatible and you can cross the two if you wish. But Genlab Alpha offers its own campaign, not about zone exploration. Instead you’re building an underground revolutionary network. You want to overthrow your masters and gain freedom from their murderous and arbitrary experiments. It’s cool and quite different. There’s a Kickstarter currently underway for the third game in the setting, Mutant: Mechatron- Rise of the Robots which has those as the PCs. Eventually we’ll see a final volume covering the remains of unmutated humanity. You’ll also see the MYZ mechanics in Coriolis, a sci-fi game. It changes up how the push system operates in an interesting way. I ran it twice. I talked about that on Episode 81 of the Gauntlet Podcast. I also posted the AP videos (session one, session two). The system also powers Tales from the Loop, which I can’t wait to actually try.